I was a little hesitant to make this recipe, since two of the ingredients--eggplant and chickpeas--are not my faves...but this dish is surprisingly good and full of flavor. 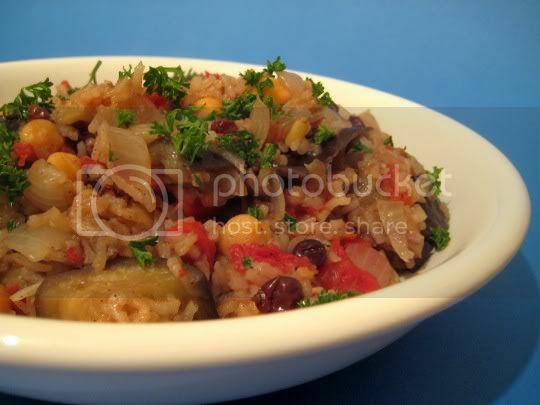 Each ingredient really stands out on its own, yet all works quite well together in the end: olive oil-infused eggplant, tangy tomatoes, pungent onions, meaty chickpeas, crunchy pine nuts, sweet currants, and earthy basmati rice, all seasoned with sweet and fragrant allspice and cinnamon. Beware of the amounts in this recipe. It calls for "3 medium eggplants"...but since there was no weight measurement (and how the hell do you determine what "medium" is), I just sort of eyeballed them and ended up with about two pounds worth (two big ones). It's also suggested to cut the eggplant into one-inch cubes. I was VERY tempted to make these about 1/2 inch, but it is better in the end to stick to the bigger sizes so they won't break down too much during cooking. Also, plan on sauteeing the cubes in two batches (or two skillets) or a VERY LARGE skillet. My standard 10-inch deep version really wasn't big enough, and I'm not sure every cube was thoroughly sauteed. Now, moving on to the pilaf. The recipe suggests using a skillet to cook all this, but I had to use a deep stockpot. There will be a LOT of food in the end, and there's no way any skillet is going to hold all of it! So...use a pot. I did try to half the recipe, but it's a little hard to halve a can of chickpeas, a bay leaf, etc. So just know that you'll probably have a week's worth of food for leftovers (6 pounds, or eight 12-ounce servings to be exact), or make this when you're cooking for a large crowd. In the end, this is a great Mediterranean-inspired dish. The rice takes on almost a creamy, sticky texture. The eggplant isn't too bad, and you'll taste bursts of olive oil from the sauteeing step. The tomatoes add a nice tanginess, the chickpeas add a denseness and savoriness, the pine nuts add a crunch, and the currants add bits of tart sweetness. A filling, hearty meal with even better leftovers. Make again? Yes...but only if I ever need to feed eight people at once!